Based on sculptor Isamu Noguchi's distinctive 1948 table design, our mid-century modern coffee table draws on his characteristic balance of form and function. The table is made up of three pieces, two solid interlocking wooden legs and a ½-inch plate glass top. The table measures 16 inches high, 47.5 inches wide, and 33.5 inches deep. 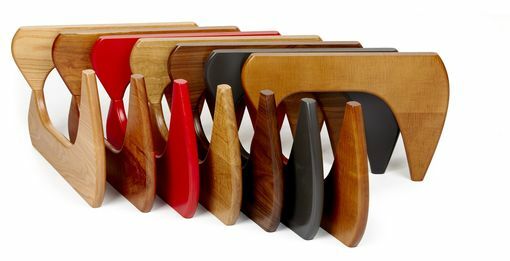 Its solid wooden base is available in red oak, cherry, red lacquer, white oak, walnut, black lacquer, and figured maple (see image).